* Note: The discount levels apply to all items listed in the CONTRA catalog and CONTRA online shop; but not for books, DVDs, TT tables, TT robots, Returnboards, frames, carrier for surrounders, test cases, complete racquets, vouchers, special / combined offers, large equipment, discontinued items and specially marked items and not listed table tennis brands. We point out that order discounts can possibly be reclaimed or corrected if the customer does not reach the order value required for an order discount after a return! Discount levels are mutually exclusive. Only one discount level is granted. We point out that order discounts can possibly be reclaimed or corrected if the customer does not reach the order value required for an order discount after a return! Discount levels are mutually exclusive. Only one discount level is granted. 3) What is the difference between order and invoice value? Order value is the value of the goods before deduction of the discount. Invoice value is the value after deduction of the discount. If a customer buys goods worth € 80, he will receive a 10% discount. That is, the invoice value is reduced to 72 euros. Thus, the customer has to pay postage, since the invoice value is under 75 euros. We point out that order discounts are then reclaimed or corrected if the customer does not reach the order value required for a job rebate after a return. For printing errors or other errors, no liability can be accepted. Starting at two coverings, you get 20% DISCOUNT * in our online shop, regardless of the order value. From four coverings you get in our online shop 25% DISCOUNT * regardless of the order value. * Already reduced items (for example special offers and not listed table tennis brands) will not be reduced again, but count towards the number of pads. *Discount only on the regular catalog price. Does not apply to special offers and discontinued items. 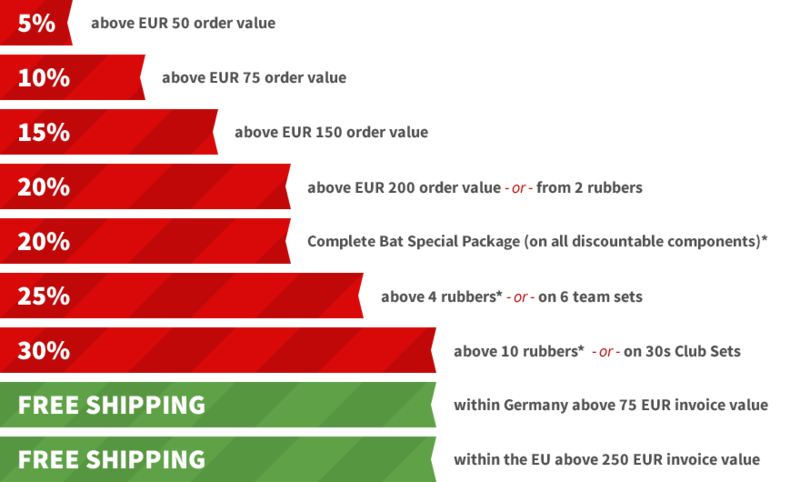 When buying a complete racket via our racket configurator, we grant a 20% discount on all discountable components (wood AND coverings).